EM-75 is a low voltage DC-power control unit. Unit is connected in series with the load. 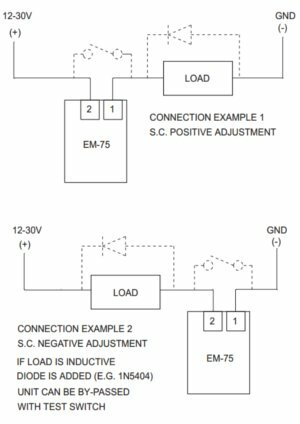 Load can be any resistive load as light bulbs and resistors, with auxiliary diode even inductive loads as solenoids, valves and motors can be controlled as well. The power is adjusted with pulse ratio method (PWM) which permits high efficiency. The change of load does not have any effect on the adjustments. As an example, if part of the bulb load is turned off it does not effect the brightness of the rest of the light bulbs. This is supposing that the operating voltage does not change. The operating voltage can be DC-voltage or pulsating DC-voltage. The unit can be connected to + or to the - side of the load. The controller can be by-passed for light bulb tests. Power stage is protected against voltage surges, overloads and short circuits. Even the incorrect polarity does not damage the unit. EM-75 causes no interferance on the radio frequency. Load capacity 3 A max.